It was my first time eating boat noodles. In fact, it was my first time learning about the existence of such a noodle in Bangkok. Also known as kuay tiew rua, it was originally served on boats plying the river and canals of Bangkok, hence the name boat noodles. My friend had wanted to try it and so I tagged along. 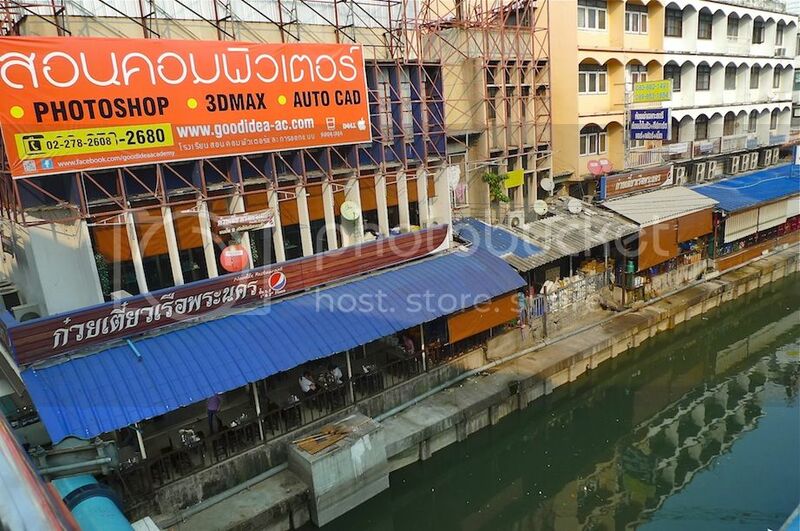 He had found out that some of the best boat noodles are sold near the Victory Monument. So on our third day in Bangkok, right after visiting Wat Pho, we took the taxi to Siam BTS Station. 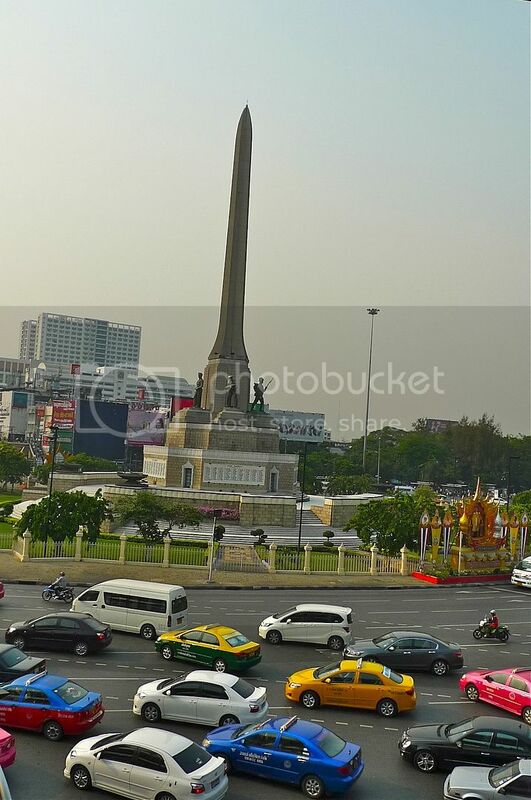 From there, we rode the BTS Skytrain and exit at the Victory Monument Station. Leaving the station, we walked along an elevated platform above the main road towards Victory Monument roundabout. 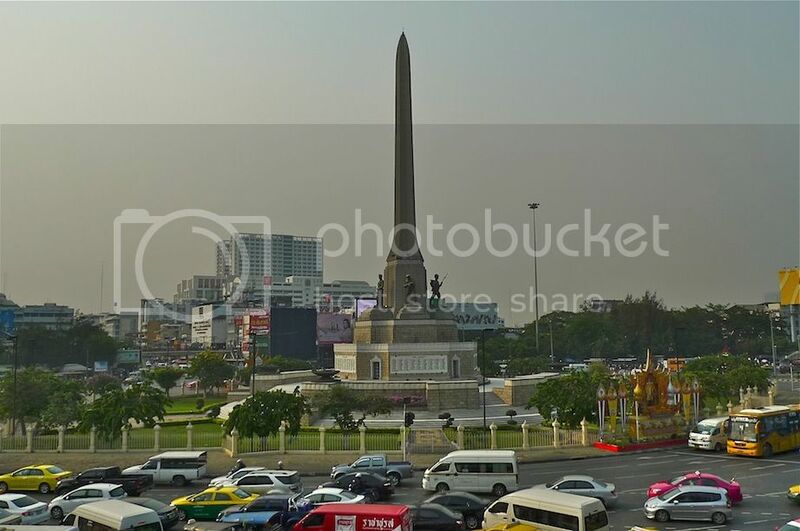 After passing the Victory Monument on our left, we continued walking until we saw a canal below on our right. There were a row of shops along the canal bank. After descending the stairs, we back-tracked to the canal and saw a few shops. We just simply chose one of the shops and went in. To our dismay, most of the workers there could not speak English! Luckily there's a menu and we just pointed at what we wanted. This is my bowl of boat noodles with beef balls. It may not look very appetizing but it was actually pretty good. It's basically rice noodles in soup with meat balls and kangkung (morning glory). I have no idea what are the ingredients for the soup but it was quite tasty. If not mistaken, you can choose the type of rice noodles and the kind of soup. I am afraid I can't give you more information as the menu was written in Thai! My friend ate pork noodles in tom yum soup but I forgot to take a picture of it! How could I be so careless? LOL! 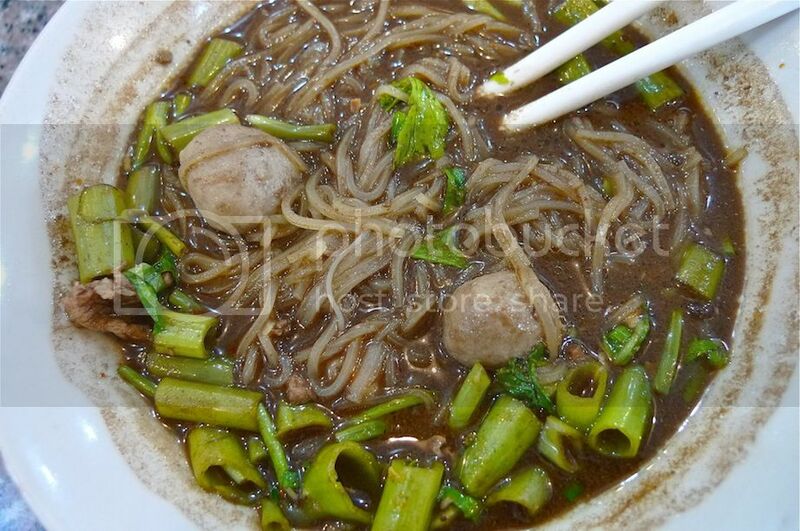 My bowl of boat noodles cost me 35 baht (USD1.15) which was pretty reasonable. However, they also sell smaller portions at 10 baht (USD0.30) per bowl! I saw other people ate from the smaller bowls and they could finish one bowl in a few gulps! Thinking back, we should have opted for the smaller bowls. In this way, we would be able to try all the different type of noodles in different soup base! Looks like I will have to return to Victory Monument for another round of boat noodles next time I visit Bangkok!